are visited on this safari. Zabargad Island is a wonderful dive site offering wall diving, a wreck and shallow areas with dozens of slender coral towers. Here live a great many tropical groupers, which are easily approached and photographed during a dive without equals in its category. When diving here at night you will find octopus, crustaceans and nudibranches emerge to crowd through the coral grottos. Rocky Island is a small fossil-coral island that emerges from the surface, elliptical in shape, surrounded by a surface level reef. The island sinks it walls down to more that 1000 metres of water. The walls are covered in soft corals and huge gorgonians which float and wave in the current. It is possible to sight many species of shark here as well as sailfish, dolphins and manta rays. St John’s is a beautiful reef system which lies approx. 40km north of the Sudanese border and 20km South of Zabargad. 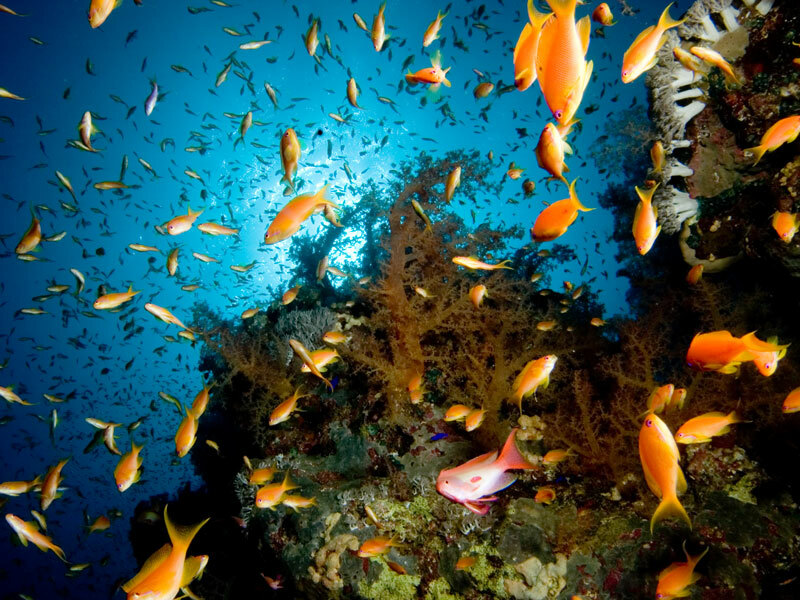 It is a vast collection of small reefs offering some of the most remote and rewarding diving in the Red Sea. Habili Ali offers giant gorgonians and black corals whilst Grey Reef, Silvertip and schools of Hammerhead sharks might be found on the west side. Habili Gafaar is a mass of soft corals teaming with shoals of Snappers, Butterfly Fish and Barracudas. Mantas, Oceanic White Tip, Grey Reef and Silvertip Sharks can be seen in the blue. Gota Kebir is a massive reef, famous for its tunnels and south plateau where Jacks and Barracudas can be seen and the occasional Manta. The tunnels are ideal for novice cave divers. Gota Soraya is rated as possibly one of the best wall dives in the Red Sea, with overhangs and cracks in the reef wall full of Glass Fish and Sweepers and an abundance of corals, Grey Reef, Silvertip, Oceanic White Tip and Hammerheads.